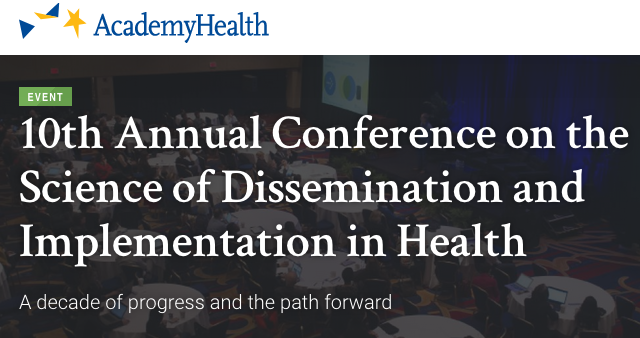 Dr. Hoover will chair a session on Addressing Implementation Context to Improve Outcomes for Vulnerable Populations at the upcoming Dissemination and Implementation Conference in Arlington, Va., hosted by AcademyHealth and the National Institutes of Health. Scaling and spreading evidence-based interventions requires strategies to reduce adoption barriers, particularly among vulnerable populations navigating a lack of resources, limited social support, and fragmented systems that can complicate efforts to address unmet needs. This session highlights methods and early findings from three studies funded by the Robert Wood Johnson Foundation Systems for Action program, which supports discovery and application of evidence on aligning the delivery and financing systems that support health and well-being nationwide. Findings illustrate how multi-system strategies mitigate implementation barriers that impede health outcomes for the elderly, low-income families, and individuals battling mental illness and substance abuse. NOTE: The Colloaborating Research Center team from Arizona also presented a poster, The Integration Quotient: Use of Claims Data to Assess Implementation of Integrated Healthcare Services, on Monday and Tuesday during the conference.